Despite all my best intentions I frequently find myself at the grocery store without my reusable bags. Which means that we have a stack of brown paper grocery bags that I keep meaning to do something with. So when I read about Tinkerlab's Paper Bag Creative Challenge I knew it was the perfect opportunity to find something to do with all our bags. We begin by just opening up a few bags and laying them on the table. I put out some drawing materials (chalk, crayons, oil pastels) and the girls just drew while we brainstormed what we could make our bags into. 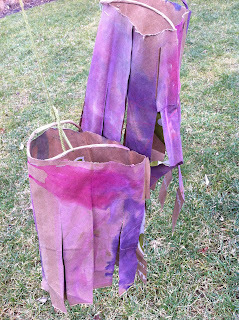 The Bee then wanted to paint them with watercolors and while painting she came up with the idea for making the bags into a kite. Which was a great idea, but since we didn't have all the stuff to make a kite I suggested making a windsock instead. She was very excited about this idea. So after the paint dried I gave her a pair of scissors and she cut up one side of the paper bag almost all the way to the top creating a fringe along one edge. I then wrapped the bag around on itself creating a round form and stapled it. We stapled the handle of the bag down to keep the round shape. I then tied a piece of yarn to the handle and we went out to fly them. The Bee and Bean held the strings and ran with the windsocks behind them. The air got caught in the center opening sending the windsock flying into the air and the cut fringe blew in the breeze. 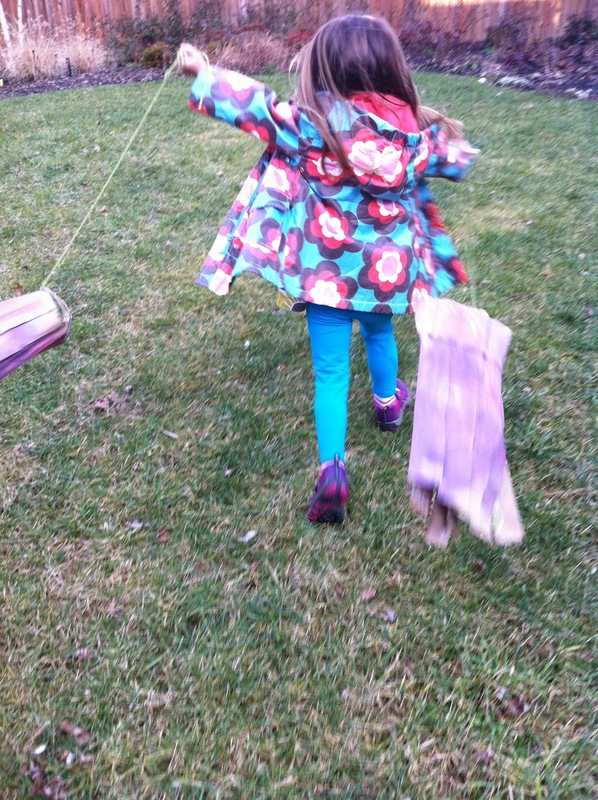 The girls were amazed by how the windsocks flew. When we were done we hung one of them on the back porch to blow in the wind and the other we brought inside to fly another day. These windsocks are great! They are just as good as kites! Beautiful! These are wonderful! We'll have to remember this for our next windy day. I know my kids would love it. Windsocks are so much fun either to watch or to play with! 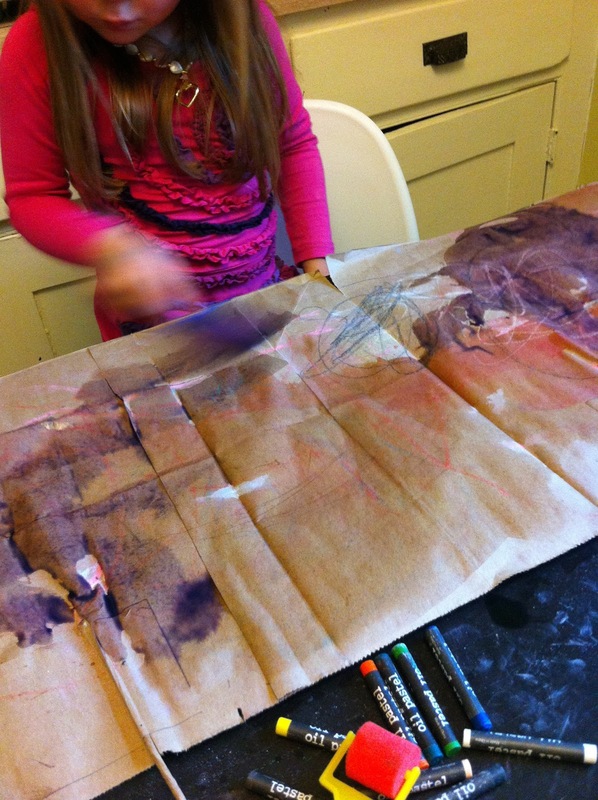 So neat that you made a windsock from a paper bag. 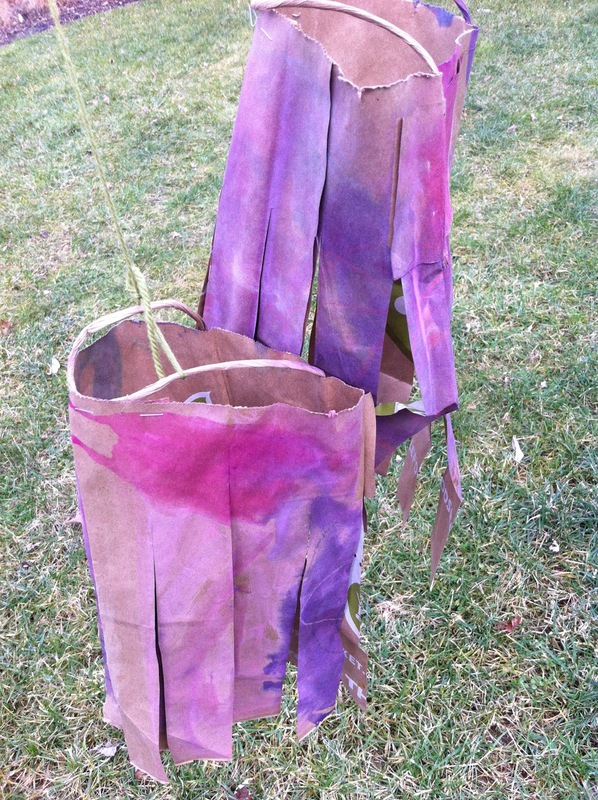 We have made them with regular paper, and they weren't very durable, but I bet the paper bag is more sturdy for the outdoors.